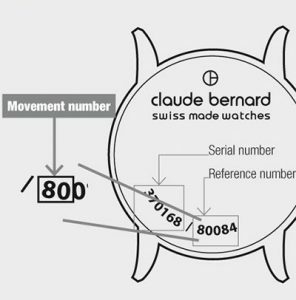 The operating instructions are related to the reference of the movement (calibre) in your watch. Please check first of all which movement is in your watch. You are able to find the reference on the case back of your watch. The first 2 or 3 digits of the reference represent the movement code. Normal position (wearing position): when the crown is positioned against the case, the crown ensures that the watch is water-resistant. Occasional winding: if the watch has not been worn for more than 40 hours or more, wind it up with the crown in position 1. Correcting the date: pull the crown out to position 2, turn the crown forwards, then push the crown back to position 1. Correcting the day: for the references 011: pull the crown out to position 2, turn the crown backwards, then push the crown to position 1. Push the crown back in. NB: For all references: do not correct the date between 22h00 and 02h00. 3.Time setting: hours, minutes and seconds. Pull the crown out to position 3. The seconds hand will stop. Turn the crown forwards or backwards. Synchronize the seconds by pushing the crown back to position 1 to coincide with a given time signal. Pusher A: start – stop, start – stop, etc. Normal position (wearing position): when the crown is positioned against the case, the crown ensures that the watch is water-resistant. Occasional winding: if the watch has not been worn for more than 42 hours or more, wind it up with the crown in position 1. Correcting the date: pull the crown out to position 2, turn the crown backwards (forwards for references 83) and push it back to position 1. Correcting the day: for the references 83: pull the crown out to position 2, turn the crown backwards, then push the crown to position 1. Time setting: hours, minutes and seconds. Pull the crown out to position 3. The seconds hand will stop. Turn the crown forwards or backwards. Synchronize the seconds by pushing the crown back to position 1 to coincide with a given time signal. Power reserve: for references 94: The small hand places in the counter at 6 o’clock indicates the power reserve. If the automatic mechanical watch is not worn, the power reserve lasts for approximate 42 hours. The power reserve can be increased by winding up the crown manually in position 1 or while wearing the watch on the wrist by the rotation of the oscillation mass. Correcting the date: pull the crown out to position 2, turn the crown forward and push it back to position 1. Correcting the date: pull the crown out to position 2, turn the crown backwards and push it back to position 1. Timing to 1 second for up to 60 minutes. Pusher B: stop to read the split time. The chronograph continues to operate. The chronograph hands catch up with the elapsed time. Pusher A: for the last stop and to display the total time. Resetting of the 60 minutes hand to zero: crown in position 2 and pusher B.
Resetting of the 30 seconds hand to zero: crown in position 3 and pusher A.
Resetting of the 5 minutes hand to zero: crown in position 3 and pusher B. After setting the hands to their original positions, return to crown position 1. Correcting the date: pull the crown out to position 2, turn the crown forwards and push it back to position 1. Timing to 1/10 of a second for up to 30 minutes. Press button A to start. Press button B after arrival of the first “sprinter” – The time will be indicated. Press button A after arrival of the second “sprinter” – The time is memorized. Read the time of the first “sprinter”. Press button B to read the time of the second “sprinter” (the chronograph hands will turn at a faster speed until indication of the time). Press button B to reset hands to zero. Press the button A and B at the same time for at least 2 seconds. Press (1 x short for single or 1 x long for continuous) button A to adjust the centre stop second. Press button B to adjust the next hand. Press (1 x short for single or 1 x long for continuous) button A to adjust the 1/10 second hand. Press (1 x short for single or 1 x long for continuous) button A to adjust the minute hand. Return to crown position 1. Time and day setting: pull the crown out to position 3, turn the crown forwards or backwards. Push the crown back to position 1. Date setting: pull the crown out to position 2. Turn the crown clockwise to set the date, then push the crown back to position 1. Cumulative Time measuring: Push button A to start the timing, push button A to stop the timing. Push button B to reset. Split Times measuring: Push button A to start, push button B to split, push button B to restart, push button A to stop. Push button B to reset. Time setting: hours and minutes. Pull the crown out to position 2. Turn the crown forwards or backwards. Push the crown back to position 1. Correcting the day: pull the crown out to position 3. Turn the crown forwards until the hands pass midnight. Repeat this operation until the desired day is reached. Correcting the date: pull the crown out to position 2, turn the crown forwards (backwards for references 86) and push it back to position 1. Calendar functions must not be altered between 11.30pm and 5.30am because automatic changes are in progress at these times. Pressing the pusher during these times may damage the movement. Rotate hands clockwise past midnight until the full moon position appears in the window on the dial. Continue rotating hands until 6.00am (outside limited time zone). Use the quick-change correctors to set the date (pusher A) and the day (pusher B) of the last full moon (see table). Then use the crown to turn the hands forwards until the current date is reached. The correct moon phase position, date and day are now set. Pressing pusher B moves the day display forward by one day. You must nor use this quick change corrector between 11.30pm and 5.30am (automatic changes mechanism in operation between these times). Pressing pusher C moves the month display forward by one month. You must nor use this quick change corrector between 11.30pm and 5.30am (automatic changes mechanism in operation between these times). Rotate hands clockwise past midnight until the full moon appears in the window on the dial. Continue rotating hands until 6.00am (outside time zone during which calendar must not be changed). Then use the quick change correctors to set the date (pusher A9, and day (pusher B9 of the last full moon (see table). Then turn the hands forwards until the current date is reached. You have now set the correct moon phase position, date and day, you can set the time. Normal position: home position, the watch runs. Correcting the date: Turn the crown clockwise for a date setting. Turn the clock anticlockwise for a 24h setting. Hand setting: watch stops. When stem is pulled out, save up to 70% energy. Correcting the day: pull the crown out to position 2, turn the crown backwards and push it back to position 1.